"A woman's a two face / a worrisome thing / who'll leave you to sing / the blues in the night." One thing's for certain—don't watch this movie if you're even remote susceptible to getting the title song stuck in your head, because I can attest that it's been rattling around my noggin for days on end now. It's no surprise, then, that the music is in many respects the best thing about this picture—Harold Arlen and Johnny Mercer wrote the score, and it's a dilly. Their terrific entries into the great American songbook are festooned all over a good-natured story that's really sort of a dramaturgical train wreck, a story loaded with implausibilities and plot turns that can put you into traction. It starts off more or less straightforwardly, a movie about getting the band together. At the hub of the wheel is Jigger (Richard Whorf), a piano player who wants to pursue his own sound—his dream is of a tight little unit playing swinging jazz, rather than the saccharine, bloated, big band sound that was on its way out. It's the classic struggle in movies about music between what's progressive and what's popular—even Scorsese uses the same basic setup decades later with New York, New York. Jigger wants to write American music, to get "the whole USA in one chorus"—there's more than a little George Gershwin in him, and he assembles a merry band, including Jack Carson as a big lug of a trumpet player, his wife, the improbably named Character (Priscilla Lane) as the girl singer, and most intriguingly, Elia Kazan as a "jazz-crazy law student" who's a relentless promoter and a pretty fair clarinetist. A barfight lands the fellas in the clink, creating the perfect opportunity for an unintentional though grotesque bit of cultural imperialism. The jail is segregated, and the white musicians hear the black inmates across the way, crooning in perfect four-part harmony the title song—so Jigger's great musical innovation is basically a straight-up ripoff of an unsuspecting bunch of African-Americans. 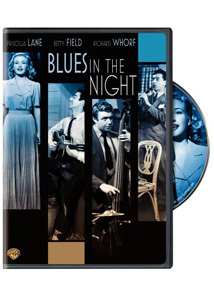 Anyway, the movie then develops a sort of schizophrenia, as the story of the band crashes straight into a film noir. The group gets a gig playing at a roadhouse just over the George Washington Bridge—though it's just a mile or so from Manhattan, we're way out in the sticks now, and we learn about a heist gone bad, the double cross, the vow of revenge, and of course the dame. Here it's Kay, played by sultry Betty Field—she's an opportunist, a maneater, and Jigger unwisely falls for her, and hard. It's one of those movies that you wish came with a road map or a flow chart, because keeping up is such a struggle. And it's almost like Jigger is as confused as we are, because he has a psychological breakdown, replete with a grand, mad montage of saxophones the size of skyscrapers and bad girls tempting good boys to do bad things. As Jigger, Richard Whorf is in kind of a thankless role, and his perpetual hangdog expression doesn't help much. You can't help watching Kazan, and seeing the director who was Method acting personified on the other side of the camera is a treat; Lloyd Nolan has a fine turn as a bad sort, too, the man who long ago done Kay wrong. The pieces surely don't add up, but there's some moodiness and some great music, which ain't bad. Image Transfer Review: An adequate transfer, though the blacks can look a little gooey now and again. Audio Transfer Review: The mono track can be a little tinny—you wouldn't expect the arrangements on a five-piece jazz band to be lush, but they could have used a little sprucing up, especially since it's the music that drives the movie. Extras Review: A couple of choice shorts raise this extras package above the pedestrian. Jammin' the Blues (10m:16s) is a stylishly shot jam session with some A-list talent, including Lester Young and Illinois Jacquet; Norman Granz, the man behind the Verve Records label, was the technical director, so it's no surprise that the musical roster is impeccable. Then it's Jimmie Lunceford and His Dance Orchestra (10m:12s), a short that begins, literally, in Hell, with an actor in a devil costume emoting amid a set full of fake flames. It's preposterous, but is only a brief prologue for Lunceford's band's great set, highlighted by their signature number, Rhythm is Our Business. A trio of Merrie Melodies cartoons make the package even tastier. Porky and Daffy are in the wilderness in My Favorite Duck (7m:36s); a rooster makes all the hens' knees weak as a Swooner Crooner (7m:19s), and then Porky takes on Sylvester and pals in a bit of interspecies warfare, Kitty Kornered (7m:05s). Along with an original trailer, there's also a brief audio outtake (1m:50s), a full orchestration of the title song. The feature is kind of a dramaturgical calamity, but the music swings for much of the picture, and the extras package features some sweet little treats.